[8 mins. 15 secs.] Filmwax Radio's Sundance correspondent, Ronald Wohlman, is back again having just appeared on our Episode 455. We continue devising Ronald's plan of attack in Park City. We'll hear back about Ronald's success upon his return... fingers crossed. [27 mins. 55 secs.] 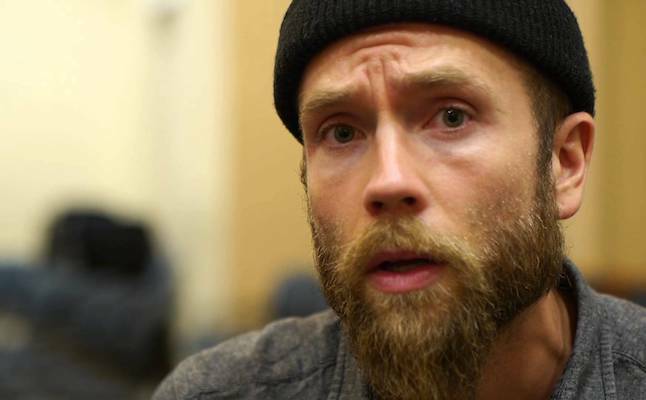 Actor and filmmaker Mark Webber ("Green Room", "The End of Love") has a new film in which he once again appears, only this time along side his mother, anti-poverty activist & 2012 Green Party vice presidential candidate, Cheri Honkala. The two are also appearing together on this segment of Filmwax Radio to discuss Mark's latest directorial effort, "Flesh and Blood", now available for streaming on iTunes, Amazon, and on demand. The film is a hybrid narrative concerning the complex relationships in the Honkala/Webber family, and also stars Webber's younger half-brother Guillermo. The film is being distributed by our good friends at Monument Releasing. Last up, [53 mins.] The two subjects of David Heinz' new film "American Folk", singer-songwriter team of Joe Purdy and Amber Rubarth. The film follows two musicians who meet on board a flight from L.A. to NYC which is suddenly canceled on the morning of September 11th, 2001. The strangers end up riding in a broken down van across country with not much more than a few guitars and the clothes on their backs. The two end up not only forming a bond with each other, but also with various Americans they meet along the way. Don't miss this special musically lush dramatic character study. The film, which also features a supporting performance by Filmwax friend Krisha Fairchild, opens in a number of theaters across the country starting Friday, January 26th. For details visit the official website. The music on this episode is contributed by Purdy & Rubarth who are just beginning a small national tour. For details check the film's website. They will be at City Winery in NYC on Friday, February 2nd, 8PM. Tickets may be purchased here.